Josh and Hazel have known each other since college when she vomited on his shoes. Hazel was the wild child and Josh always liked her but thought she was a bit too much. Now years later the two of them meet up again and become the best of friends. Knowing they are both undate-able for each other, they set out on a series of double dates each more unfortunate than the last. But they might be having more fun with each other than anyone else…. It took me until the end of chapter 1 to realize I had been smiling the entire time I had been reading. Throughout reading this book I would continue to find myself smiling and laughing out loud. Sometimes I was laughing so hard I had to put the book down before diving right back in. To say I loved this book is an understatement, and it came into my life exactly when I needed it. 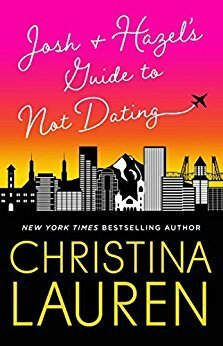 Christina Lauren is an author duo who only get better with every new release. How is that even possible? Most authors tend to go downhill, get boring or deliver the same book with a new cover. Not these two!!! They’ve cemented themselves into a favorite author spot for me, and I know they are automatic one click authors. Josh and Hazel are characters I loved equally, but for very different reasons. I loved Hazel’s bright inner light, her eccentricities, and how she was aware she was different from everyone else but was unwilling to change for anyone. I loved how Josh got Hazel and accepted her, never wanting to change her. He’s more a stoic type, but the kind that will quietly be beside you through everything. This book is going into my best of the year list! I LOVED IT! It’s a special story and I really do hope reader’s everywhere will pick it up and enjoy it even half as much as I did. ARC provided by the publisher via netgalley. All/any quotes in this review came from an advance unedited copy and may be subject to change in the final product.